As the dawn chorus gave way to the sound of the school run, it still wasn’t at all obvious that we were going to have a good solar viewing day. The clouds weren’t great and the forecast wasn’t much better. Still, perhaps we’d get a couple of hours of showing and telling the public what the sun looks like. On the discussion forum we thought it might help if we put up a few optimistic postings of links to The Beatles (Here Comes the Sun), Morecambe & Wise (Bring Me Sunshine) and The Temptations (I’ve got sunshine on a cloudy day…). Mike preferred a more scientific suggestion – the Zarkov Cloud Gun. It was my first time at one of these events and what a great day it turned out to be! Things were looking up – in more ways than one – by the time we started at 11am. Dave, Clive and I started dragging people out of the walkway beside the car park into the Harrison Terrace by the Planetarium dome. 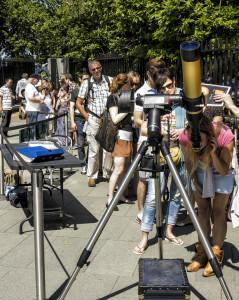 The reaction was surprisingly positive, though Clive did encounter one tourist who wasn’t interested in looking through a solar telescope unless he could see Jupiter and Saturn. Oh, well. Can’t win them all. For four hours the sun shone. While hardly a minute went by without the clouds coming over, they always cleared again within a minute or two. No doubt Mike’s Zarkov Cloud Gun helped (I promised to organise a whip-round for replacement ammunition). 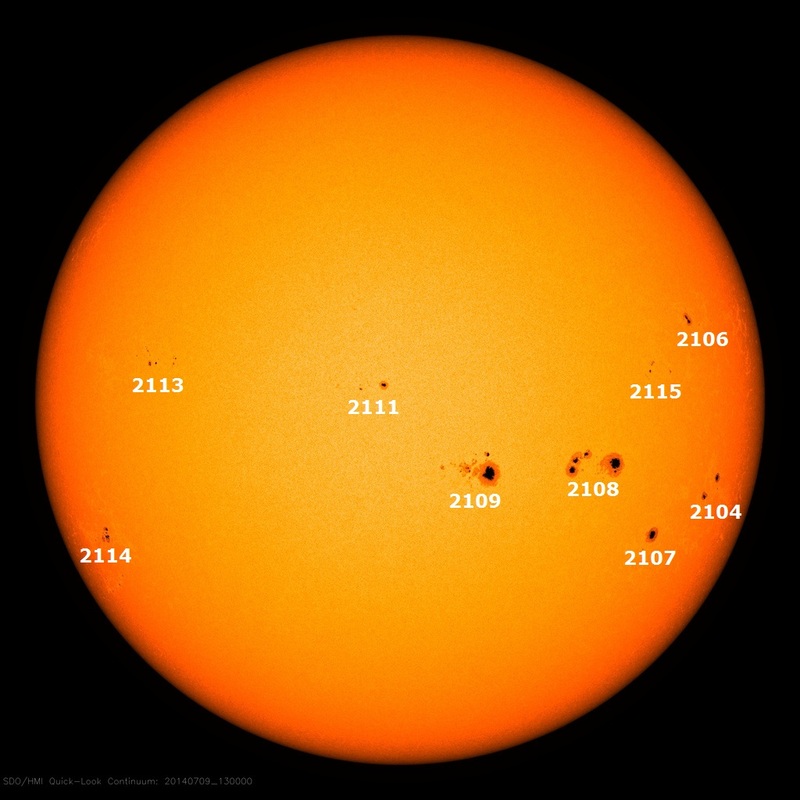 We could see about eight or nine sunspots, a nice prominence on the left-hand (eastern) limb of the sun and, if you looked carefully, the orange peel-like surface. It was fantastic to see the reaction by members of the public. Once they realised that all they were being asked to do was look through a telescope and not sign up for a time-share on Neptune, they were very relieved and most grateful for the scientific knowledge and experience we tried to impart. A few even understood what we meant by H-alpha, though we generally kept the technical knowledge at ‘entry level’. We had viewers from Australia, China, Japan, Hungary – even a few Brits! Their reactions were fantastic. Lots of “Wow!” and “Cool!” and “That was awesome!” My favourite was an American who looked through the scope and said, “Damn!” as though it were a two-syllable word. Those who couldn’t speak a word of English still expressed their amazement with raised eyebrows and big smiles. We inadvertently had a gang of about 30 school kids from Dagenham who were surprisingly patient as they queued up to take their turn. As the sun and clouds were coming and going about every minute or so, I was wondering how long it would take to let all the kids get a look! A gold star to one girl whom I told, “This is a special telescope and you can’t use it to look at the stars.” “Yes, you can!” she said, as she pointed at the sun. “That one!” Clever girl. I met lots of interesting people, including a high school astronomy teacher from the States, a guy from Belfast who told me about James Clerk Maxwell’s burial place in rural Scotland and Lord Kelvin’s tide calculator (mission: look for it in the Science Museum) and a young Russian girl who is really interested in deep sky observing and asked us what kind of telescope she should buy. Nick and Mike kept a weather eye out but by 3pm a cloud the size of Dogger and German Bight put together came overhead and we packed up. But we got four hours of viewing, and easily a couple of hundred viewers. My only regret was not bringing a hat with me to protect my bald pate – proving just how badly it’s possible to risk-manage a solar viewing event.